Most of the products we buy and consume are bound to reach their ‘end of life’ at some stage. To date, business and industry have customarily followed an economic model that is built on the premise of ‘take-make-consume and dispose’. When goods worn out or are no longer desired, they are often discarded as waste. Such a linear model also assumes that raw materials and resources are abundant, available and cheap to dispose of. However, the improper disposal of waste in landfills could cause health risks for society. Similarly, industrial and mining activities are causing resource depletion as well as pollution problems. The incineration of waste products also creates the need to dispose of residual toxic metals, including lead and mercury, which could also contaminate groundwater. Notwithstanding, it is envisaged that the reserves of some of globe’s key elements and minerals shall be depleted within the next century. At the same time, land degradation is constantly impacting on the natural environment, as arable land continues to disappear. In addition, plastic waste dumped into our seas and oceans is responsible for the deaths of millions of fish, seabirds, and sea mammals. Furthermore, the warming of the earth’s climate, that is one of the outcomes of carbon emissions from fossil fuels, is yet another serious problem facing today’s society. The world’s growing populations and their increased wealth is inevitably leading to greater demands for limited and scarce resources. Boulding’s famous paper from 1966, “The economics of the coming spaceship Earth” anticipated that man will need to find his place in a cyclical ecological system which is capable of continuous reproduction of material. He went on to suggest that at the other end the effluents of the system are passed out into noneconomic reservoirs, including the atmosphere and the oceans. Of course, these ecological environments are not appropriated and do not enter into the exchange system. Twenty-five years ago, Granzin and Olsen (1991) reported that the US municipalities were already running out of landfills. These contentious issues underline the perennial conflict between economic development and environmental protection. Today’s society and its economic models still rely too much on resource extraction and depletion. If solutions are to be found, the public must be encouraged to alter a number of its irresponsible behaviours. In this light, this contribution suggests that there is scope in using resources more efficiently; as better eco-designs, waste prevention and reuse of materials can possibly bring net savings for businesses, while also reducing emissions. In fact, WEF (2014) indicated that a shift towards CE can generate over US$ 500 million in material cost savings, 100,000 new jobs and prevent 100 million tons of waste globally, within five years. This means that there is a business case for CE as significant resource efficiencies could bring a new wave of smart, sustainable growth and competitiveness. The basis of the CE economic approach lies in extracting the embedded costs of resources; through re-using, repairing, refurbishing, recycling and restoring materials and products throughout their life cycle. Arguably, what used to be regarded as ‘waste’ could be turned into a valuable resource for business and industry. The CE concept could be perceived as a response to the aspiration for sustainable growth in the context of increased regulatory pressures toward controlled operations management and environmentally responsible practices. Therefore, the setting of coherent policy frameworks and appropriate legislation could help to raise the bar for more responsible behaviours amongst public and private organisations. Initially, the CE approach was being implemented in western countries were it was championed by a number of environmental NGOs (EMF, 2013; WEF, 2014). However, back in 2008, the People’s Republic of China had enacted a national law that promoted the CE model. Interestingly, China has experienced an average economic growth of 9.5% over the past two decades (since the start of their business-friendly policies and reforms). The United Nations Environment Program (UNEP) has recognised the significance of the rapid industrialisation in the Chinese scenario. Hence, UNEP in collaboration with the European Commission and Asia Pro Eco Programme have supported the Chinese city of Guiyang through the ‘Policy Reinforcement for Environmentally-Sound and Socially-Responsible Economic Development – PRODEV. In 2003, this city was still considered a relatively, underdeveloped region although it had a population of more than 3 million. For this reason, Guiyang had great potential as a pilot city for the exploration of sustainable development models (UNEP, 2006). In 2005, PRODEV supported Guiyang’s policy frameworks, financial systems that were intended to help the private sector development, facilitated technology transfers and sustained infrastructural development. PRODEV specified the best environmentally sound practices as it demonstrated the use of cleaner production processes (UNEP, 2006). Guiyang’s businesses have learned how to increase their operational efficiencies through better use of resources. These developments have also brought significant cost savings, and improvements in the firms’ bottom line. At the time, China needed a new sustainable development model which had the ability to ‘achieve improvements in resource productivity and eco-efficiency’ (Yuan, Bi, and Moriguichi, 2006:7). The country’s central development goal came into force in January 2009 as environmental conditions were expected to deteriorate due to rapid urban and industrial growth prospects. In a similar vein, the European Union (EU) Commission has encouraged businesses to reuse, recycle and reduce resources to prevent the loss of valuable materials (EU, 2014). The EU Commission explained that, “new business models, eco-designs and industrial symbiosis can move the community towards zero-waste; reduce greenhouse emissions and environmental impacts” (EU, 2014:4). It transpired that the Europe has already started to prepare the ground work toward this transition. In fact, the ‘Resource Efficient Europe’ was one of the EU2020’s flagship ideas. This EU initiative involved the coordination of cross-national action plans and policies on the formulation of sustainable growth. The EU’s CE proposition was intended to bring positive environmental impacts, real cost savings, and greater profits. EU (2014) indicated that improvements in waste prevention and eco-design, the use and reuse of resources, and similar measures could translate to a net savings of € 600 billion, or 8 % of annual turnover (for EU businesses), while reducing total annual greenhouse gas emissions by 2-4%. This EU communication anticipated that the market for eco-industrial products will double between 2010 and 2020. It also posited that internationally, resource-efficiency improvements are in demand across a wide range of sectors. Lately, the EU has published a call for researchers, specifically in; (i) CIRC-01-2016: Eco-innovative approaches for the circular economy: large-scale demonstration projects, (ii) CIRC-02-2016: Water in the context of the circular economy, (iii) CIRC-03-2016: Smart specialisation for systematic eco-innovation / circular economy, (iv) CIRC-04-2016: New models and economic incentives for circular economy business and (v) CIRC-05-2016: Unlocking the potential for urban organic growth (EU, 2015b). Moreover, the European Fund for Strategic Investments (EFSI) has also unleashed a new financing avenue for future investments in infrastructure and innovation, including circular economy projects and closed loop systems. Across the Atlantic, the US and Canada have also endorsed the circular economy perspective. The US Chamber of Commerce Foundation described the circular economy as a model that focuses on the careful management of material flows through product design, reverse logistics, business model innovation, and cross-sector collaboration. The US Foundation recognised that this regenerative model offers viable business opportunities that tackle environmental issues while stimulating economic growth and development. Similarly, Canada’s ‘Circular Economy Working Group’ (CEWG) has also encouraged the wider adoption of circular approaches as illustrated in Figure 1. This working group supports knowledge sharing on CE through a series of webinars and other avenues. They also featured numerous case studies that have presented the benefits of key circular business models. Although the circular economy is a relatively new notion, there could be potential pitfalls in its policy formulation and application. Moreover, businesses and industries would probably resent being imposed any mandatory changes in their established behaviours. It is very likely that they would opt to remain in their status quo, where they are ‘locked-in’ to their traditional linear models. For the time being, many companies could not be knowledgeable about the CE perspective. The terms that are actually being used to describe both linear and circular economies are potentially misleading, as both combinations already exist, but in very different contexts. Arguably, the long term investments for an active engagement in sustainable CE practices could possibly result in significant improvements in operational efficiencies. However, CE approaches may still be perceived as novel, risky and complex. Notwithstanding, the prices of green technologies do not necessarily reflect the real costs of resources and raw materials. Macro-environmental factors, including political, economic, social and technological issues could also impact on CE behaviours. Moreover, there may be policy makers and regulators who may not want to support the transition towards the circular economy. Of course, it would be better if governments, civil societies and the respective industries work in tandem to resolve the contentious issues relating to the increased scarce and limited resources, across the globe. In conclusion, the CE concept has the potential to maximize the functioning of global eco-systems as it could lead to significant benefits to societal well-being. There are implications for the re-alignment of economic and management practice with well laid-out ecological and social models. Future research should begin to incorporate the latest ecological knowledge into our understanding of naturalistic economic models and systems, without silencing the social and human dimension. Accenture. (2014), “Circular Advantage: Innovative Business Models and Technologies to Create value in a World without Limits to Growth”, available at: https://www.accenture.com/us-en/insight-circular-advantage-innovative-business-models-value-growth.aspx (accessed on the 12th October, 2015). 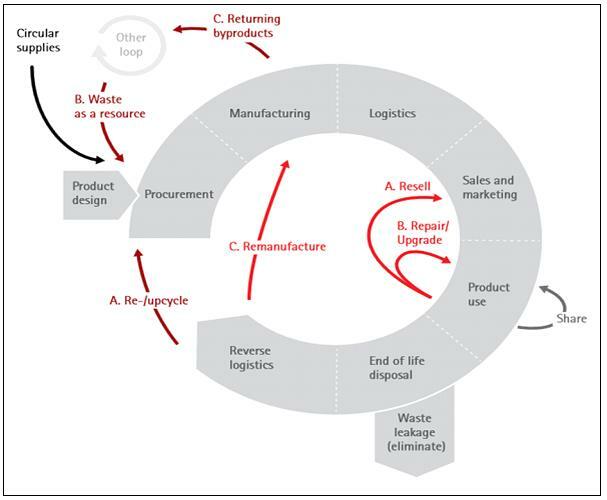 EMF (2013), “Towards the Circular Economy. Ellen MacArthur Foundation Rethinking the Future”, available at: http://www.ellenmacarthurfoundation.org/assets/downloads/publications/TCE_Report-2013.pdf (accessed on the 28th October, 2015). EU (2014), “Attitudes of Europeans towards Waste Management and Resource Efficiency”, European Commission, Brussels, available at:http://ec.europa.eu/public_opinion/flash/fl_388_en.pdf (accessed on the 17th October 2015). http://ec.europa.eu/research/participants/portal/desktop/en/opportunities/h2020/calls/h2020-ind-ce-2016-17.html#c,topics=callIdentifier/t/H2020-IND-CE-2016-17/1/1/1&callStatus/t/Forthcoming/1/1/0&callStatus/t/Open/1/1/0&callStatus/t/Closed/1/1/0&+identifier/desc (accessed on the 5th November 2015). Granzin, K. L. and Olsen, J. E. (1991), “Characterizing participants in activities protecting the environment: a focus on donating, recycling, and conservation behaviors”, Journal of Public Policy & Marketing, pp. 1-27. UNEP (2006), “Circular Economy: An alternative model for economic development”, United Nations Environment Programme. Paris, France, available at:http://www.unep.org/resourceefficiency/Portals/24147/scp/nap/circular/pdf/prodev-summary.pdf (accessed on the 25th October 2015). WEF (2014), “Circular Economy Can Generate US$ 1 Trillion Annually by 2025”, World Economic Forum, available at: http://www.weforum.org/news/circular-economy-can-generate-us-1-trillion-annually-2025 (accessed on the 27th October 2015). Yuan, Z., Bi, J. and Moriguichi, Y. (2006), “The circular economy: A new development strategy in China”, Journal of Industrial Ecology, Vol. 10 No. 1, pp. 4-8.